Well hello again lovelies. 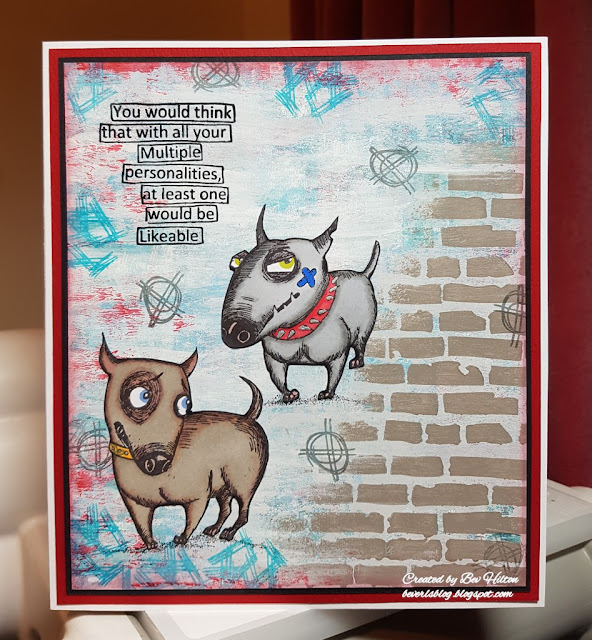 I have made a fun make this time with these adorable dogs from Katzelkraft, don't you just love them. I wasn't totally happy with the background here as it didn't go quite to plan but hey ho, didn't have the time to start again. PaperArtsy Smoothy White Card 350gsm. Katzelkraft... Mini 085 and 086. Verse Stamp I'm unsure of as have no packaging. PaperArtsy Fresco Finish Chalk Acrylic Paint... Smurf, Space Cadet, Concrete, Snowflake, London Bus and Taupe. Ranger Distress Ink... Barn Door. Ranger Archival Ink... Watering Can and Garden Patina. I began with a piece of card 6.5" x 7.5". I began layering over the fresco paints using a breyer until happy with the look, making sure the right side was left light. Lay over the brick wall stencil and using a stencil brush, apply the taupe fresco paint. Set this aside to dry thoroughly. Stamp the images onto some smooth white card. I used promarker alcohol markers to colour my images but you can use whatever colouring medium you like. Carefully cut these out and using a black marker, carefully go around the edge so that there will be no white edges showing. Glue the images to the background card. I used a dots pen to ground the dogs. Take the verse and stamp in place with black ink. I used one of the texture stamps from Leonies texture set and stamped around the edge using the garden patina and one of the stamps from the Emma Godfrey stamp set to stamp the crossed circles using Watering Can. Blend around the edge of the card with the Barn Door Distress Ink and then mount the finished piece onto black card. Then mount to a matching piece of red card before mounting onto a white card base. Hope you like it. Enjoy the rest of your Sunday and hope you all have a good week. Bev it is so wonderful, love the two, -naughty and cute , together, and love the fantastic background, dear friend. A gorgeous creation. Hope today was kind .